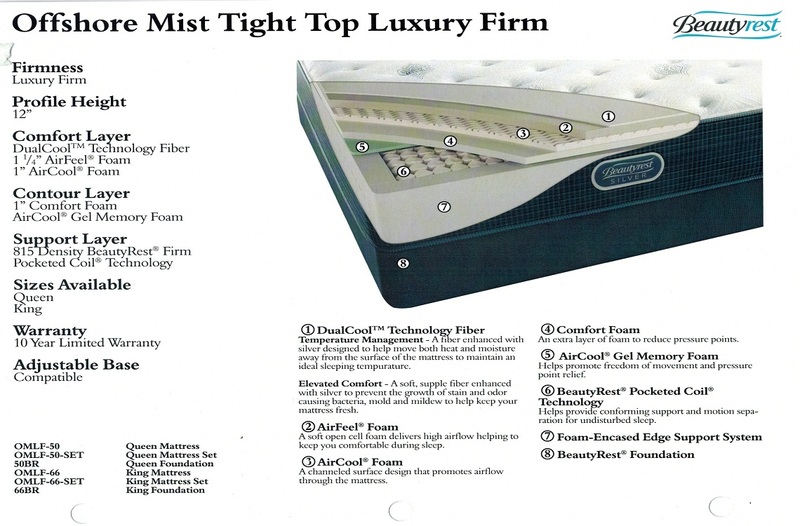 The "Offshore Mist Luxury Firm" mattress is more than just a sleekly-designed Recharge mattress. There are a lot of great features here that truly benefit sleepers of all types! SurfaceCool Fiber, AirCool Foam, GelTouch Foam and AirFeel Foams all contribute to this luxurious mattress model providing a reasonably cooler sleeping experience. QuantumLock edge technology drastically cuts down on motion transfer and sway-motion. The 800 Density Pocketed Coil adapts to the tension of your body weight but, is made from a lower-gauge metal that has a long-earned reputation for durability. 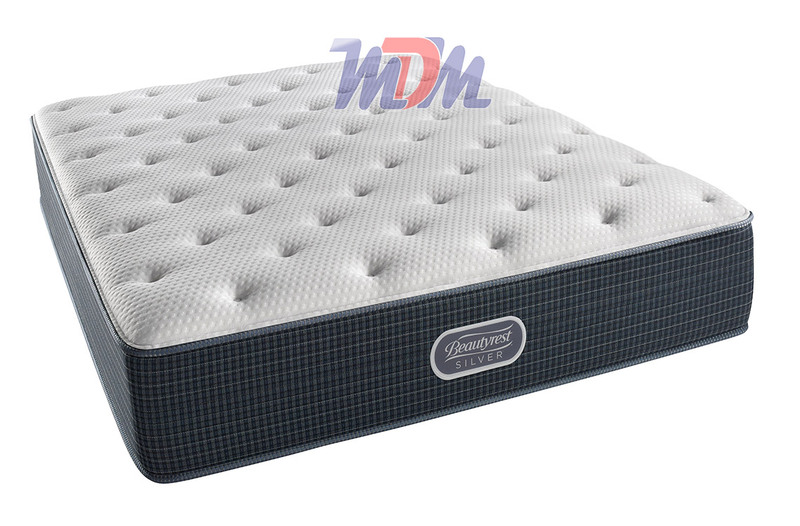 With this mattress, you'll get a reasonably firm sleeping surface, plenty of support, luxurious and body-shaped foams, a lack of transferred body heat and a stable base. You really can't ask for more! Top-notch luxurius features - with a median price point; the "Recharge: Silver" series, as a whole, is a hard mattress line to compete with. The Simmons BeautyRest brand is well-known and well-reviewed with good reason! Another update on a BeautyRest mattress that was a customer favorite, the "Offshore Mist Luxury Firm" replaces last year's Q Palm Luxury Firm. This is a model for the individual or couple who seeks a firmer sleeping surface but one that contours with their body weight and resting position. While it's an overused term in many cases, this "Recharge: Silver" series Simmons mattress is truly a "luxury firm". The individually-wrapped pocketed coils will seem to give the mattress a cushy feel when one just sits on it. However, when body weight is spread out amongst the coils, the innerspring system reacts according and provides a very sturdy, supportive cradling effect. I highly recommend this mattress if you spend a lot of time sleeping or just lying on your side. It has just enough 'give' to help prevent pushing-back against the hip bone. There are almost three inches of Simmons's patented foams atop the superior coil unit and a very dense Energy Foam - down below - that give you an unparalleled level of support and durability. The aforementioned top layers (and SurfaceCoil fiber, in the cover) also reduce heat absorption so, 'hot sleeping' shouldn't be an issue with this model. On our firmness scale, we've got this one right around a "7" out of 10. If you love the reliability of Simmons BeautyRest quality and a luxurious feel but, you're looking for something more plush and overall softer; check out the Simmons Offshore Mist Pillow Top Plush (Recharge) Mattress.